Scott O’Dell’s Island of the Blue Dolphins and the true story behind it. 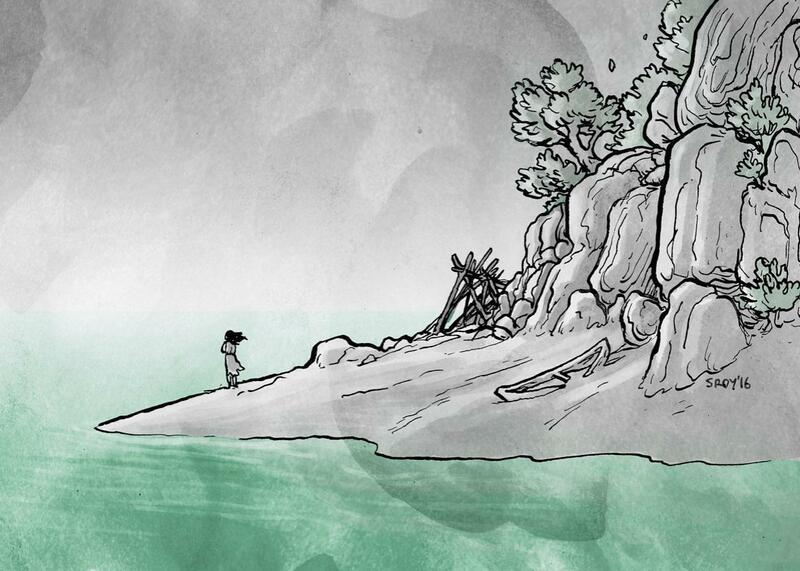 How the great children’s novel about a girl left alone on an island in the Pacific was written—and the real girl whose story inspired it. On any given afternoon of my 11th summer, I could be found in the most unkempt corner of my family’s suburban California back yard, building tiny racks with twigs and grass and draping strips of uncooked bacon over them. I dug pits lined with stones and attempted to fashion splintered chicken bones into spearheads. A neighborhood friend often joined me there; we’d just read Scott O’Dell’s Island of the Blue Dolphins and we were obsessed. Published in 1960, winner of the Newbery Medal, with more than 8.5 million copies in print, O’Dell’s novel, about a Native American girl, Karana, stranded alone on an island after the rest of her village leaves, is one of the most successful children’s novels of the 20th century. Despite its age, despite a bad 1964 film adaptation featuring (predictably) a white actress playing Karana, and despite dramatic changes in what cultural arbiters view as acceptable portrayals of Native peoples, the novel remains a fixture on school reading lists. Not many of the books I adored as a kid hold up to adult scrutiny, but this is one that does. A new “complete reader’s edition” of the novel has just been issued by the University of California Press, featuring an account of the composition of Island of the Blue Dolphins, an annotated text that includes (at the end) two chapters excised from the final version and essays by an archaeologist and a critic writing on the historical figure who inspired it. That figure is known as the Lone Woman of San Nicolas Island, the outermost of the Channel Islands off the coast of Southern California. In 1814, her people (usually called the Nicoleños, after the name the Spanish gave to the island) clashed violently with Kodiak Islanders from Alaska, Natives who were conscripted by the Russian American Company to hunt otter in the kelp forests off the island’s coast. A massacre ensued, and 20 years later a ship from Mexican California arrived at San Nicolas to bring the remnants of the community to the mainland. According to dubious popular accounts, one woman leapt from the deck of the departing ship upon learning that her child had been left behind. After the child was killed by a pack of feral dogs, she lived on San Nicolas alone for 18 years, until an expedition led by the explorer George Nidever persuaded her to leave the island for the Santa Barbara Mission, where she was baptized and christened Juana Maria. Authorities were unable to locate anyone who could speak her language. She died, from obscure causes, seven weeks later. O’Dell’s novel compresses the interval between the massacre and the evacuation to a single year and makes Karana a 12-year-old who jumps overboard to rejoin her little brother. O’Dell kept the homicidal wild dogs, however, and the rest of Island of the Blue Dolphins recounts Karana’s struggle to survive on her own, using both the skills she learned growing up and new ones, such as making weapons and hunting, prohibited to girls in her culture. As a kid, I regarded it as the best how-to story ever, better even than the Little House series. It’s also a love story. At first, Karana vows revenge on the pack of wild dogs that killed her brother, and she takes out a half-dozen of its members. Finally, one of her arrows strikes her archnemesis, the gray-furred, yellow-eyed leader of the pack, a creature she believes was brought to the island by the otter hunters who killed her father. But when the moment comes to finish him off with a final shot, Karana can’t do it: “I stood on the rock with the bow pulled back and my hand would not let it go.” She brings the dog to the house she’s built and nurses him back to life. The dog, Rontu, one of the great literary canines, becomes her constant companion as she explores the island’s tidal caves in her canoe, fishes for abalone, and battles a giant “devilfish” (octopus). 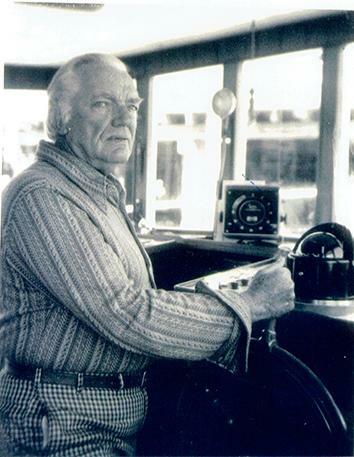 Scott O’Dell at the helm, 1972. O’Dell was 60 when he wrote Island of the Blue Dolphins, a veteran of the early film industry, in which he worked as a cameraman, and the newspaper business. He thought like a reporter, working, as Sara Schwebel’s introduction to the new reader’s edition details, from multiple primary and secondary sources on the Lone Woman and the indigenous peoples of the Channel Islands. He also ran early drafts of the novel past friends involved in the nascent academic discipline of anthropology. But next to nothing is known about the Nicoleños. The Lone Woman’s neighbors and relatives dispersed into the general population of California, and anyone who recalled their language, history, or beliefs did not write any of it down. O’Dell combined legends and customs from nearby peoples on the Channel Islands and the mainland, and he describes some of the region’s artifacts, like the pitch-lined baskets used to carry water, in careful detail. Other details, like the islanders’ use of two names—a public one for strangers and a true one for trusted intimates—he simply made up. Inevitably in the five-and-a-half decades since Island was published, questions about the legitimacy of a white man writing from the point of view of a Native American woman have cropped up, but no one’s ever really made such criticism stick. An essay, “A Counterstory of Native American Persistence” by Carole Goldberg, included in this new edition, labels the novel a “vanishing Indian” narrative, a story of “the extinction or complete assimilation of the peoples who occupied North America before Europeans invaded,” and treats such disappearances as a sad, sentimental inevitability. But to support this view, Goldberg has to lean heavily on O’Dell’s brief author’s note, in which he reports that the Lone Woman’s people “had long since disappeared” by the time she reached Mission Santa Barbara. The novel itself, narrated by Karana, ends with her boarding the ship she hopes will reunite her with her family and former neighbors, looking forward to a new life, with Rontu’s pup by her side. On the other hand, the notion, cherished by many educators, that Island of the Blue Dolphins represents an advance for diversity in children’s literature also seems like a species of wishful thinking. It isn’t really a novel about being Nicoleño or Native American because those identities have little meaning for Karana once she gets left behind. Above all, Island of the Blue Dolphins is a novel about being alone, and cultural identity becomes vaporous when you have nobody to share it with. The diction O’Dell chose for Karana’s voice—unsophisticated but not simple, bluntly practical yet infused with significance—may remind some critics of the terse, article-free English spoken by stereotypical “movie Indians,” but its closest family resemblance is to Hemingway, another novelist with a newspaper background. It isn’t hunter-gatherers who fantasize about a rugged individual’s life triumphing in a battle against nature, after all. They know better; there’s survival in numbers. Schwebel does have an inkling of how much Island of the Blue Dolphins taps into the unconscious of 20th-century European-American life. She notes that O’Dell, writing during the peak of the Cold War, played up the role of Russian colonialism in the depredation of the island and the massacre of Karana’s fellow villagers. But she misses a far more significant parallel in the dilemma the islanders face after the Russian-led trappers slaughter most of the village’s able-bodied men. The old man who takes charge proclaims that “the women, who were never asked to do more than stay at home, cook food, and make clothing, now must take the place of the men and face the dangers which abound beyond the village.” As a result, Karana pointedly reports, the women work so hard that the village “fared better than when the hunting was done by men.” The remaining men, predictably, take exception to this, complaining “that the women had taken the tasks that were rightfully theirs and now that they had become hunters the men looked down on them.” Island of the Blue Dolphins has often been celebrated for its portrayal of a strong female character, but no one, that I can find, has noted the marked parallels between this part of Karana’s story and American life during and just after World War II. In a way, Island of the Blue Dolphins also anticipates the post-apocalyptic narratives that are a staple of publishing for young readers today. Karana inherits a vacated world, scavenging an initially precarious existence amid the rubble of plenty and community. Once she burns down the village to purge the memory of what she’s lost, she gets to make island life over to her own liking. What enchanted me about Island of the Blue Dolphins as a child was exactly what dismays my adult friend now, a dream that the Nicoleños too would probably have regarded as a nightmare: complete freedom from adult authority, from interfering neighbors, from everything else that annoyed me about other people. A daydream of self-sufficiency in the company of trusty (and uncritical) animal companions. Mini-individualist that I was, I came away from the book without much sense of what it meant to be an indigenous Channel Islander—in fact, I had the vague notion that the novel was set in the Pacific Northwest instead of relatively close to my own hometown. Its value had nothing to do with the lessons on cultural representation and feminism it supposedly imparts, just as the pathos I find in Karana’s story as an adult transcends any vanishing Indian cliché; it is entirely particular to her because her experience, the Lone Woman’s experience, is so extraordinary. The bacon strips I hung out to dry on my makeshift backyard racks were the closest thing to abalone that I could find in our refrigerator; they were not, of course, like the protected mollusk at all. The dream of a great work of fiction is to make us feel, however briefly, that a distance like that doesn’t matter. Island of the Blue Dolphins: The Complete Reader’s Edition by Scott O’Dell, edited by Sara L. Schwebel. University of California Press.